It’s Autumn, and Jess Exiner from Whitehouse Nursery tells us about how to plant Chinese Herbaceous Peony Roses. Autumn is the time to plant Chinese Herbaceous Peony Roses. Peony Roses are magnificent spring flowering perennials with sweetly perfumed blooms reminiscent of roses. The Chinese regard these plants as the Queen of flowers and are thought to represent good fortune, love and prosperity. Most peonies reach up to 1m high and wide. Blooms are generously sized and come in an array of rich and beautiful shades and combinations. 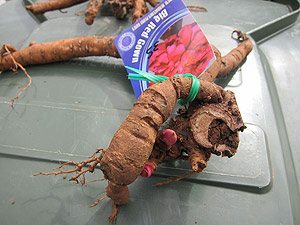 One should be very careful buying the Peony root and bud. Look for nurseries that sell 1- 3 buds on a large root system. When peonies are cut out of the ground to be sold, they lose their ability to find nutrients and rely on a large root system to give them the nutrients they need to grow and flower. A small root system will mean that it may take up to 7 years for the peony to flower. This is because they need to grow a large root system before they can flower. The peony that is sold with a large root system will have the nutrients it needs and will flower in the first year of planting. Check with your nursery before you buy. Planting and Care. Plant peonies so that their buds are approx. 25mm deep in the soil (they will not flower if they are planted too deeply). 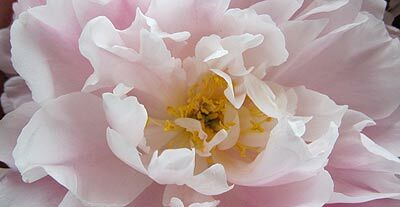 Peonies prefer a loamy soil and a slightly alkaline pH of 7 to 7.5. This can be achieved by adding a few handfuls of dolomite lime to the soil. Select a sunny, warm position. Feed twice a year in spring after flowering and again in mid autumn with plentiful amounts of humus rich compost such as well rotted animal manure. Mulch soil surface well but avoid covering too thickly. Cut back to ground level in early winter when they are dormant. If you already have peonies and they haven’t flowered for some time, dig them up again now and replant them with their buds no more than 25mm below the soil surface. Sometimes over time they sink into the ground and lose the ability to flower.